Uveitis is the term used to describe inflammation to an area of the eye called the uveal tract, or simply uvea. 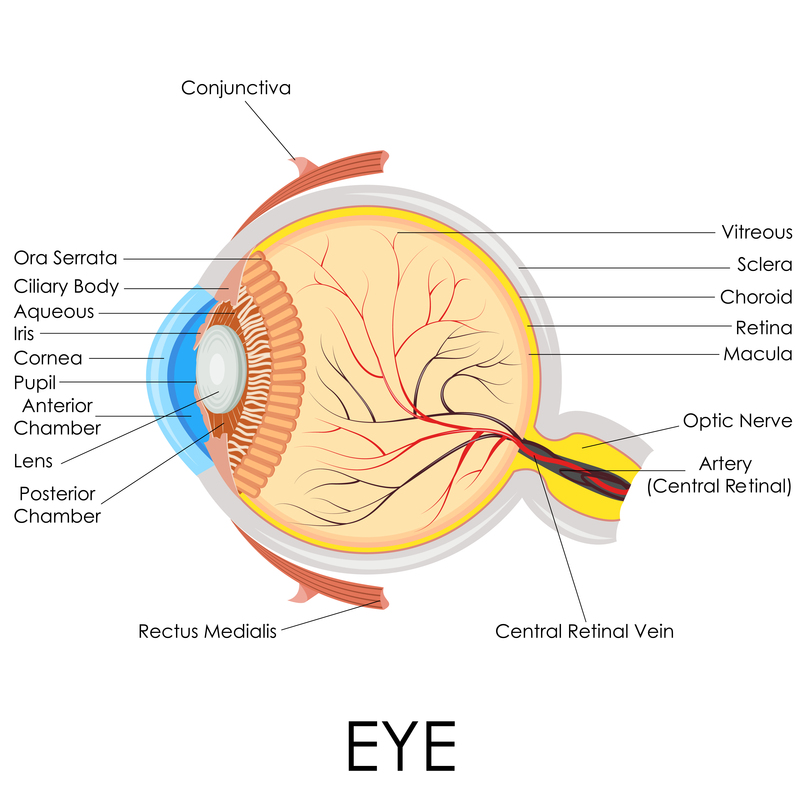 The uveal tract runs from quite close to the front of the eye, right the way to the back. Therefore if there is any inflammation at any point along this tract, then it will come under the umbrella term of uveitis. Uveitis can broadly be separated into those types caused by infection, and those which are not (non-infectious uveitis). In addition to this, we often categorise uveitis according to the area of the eye that is affected. If the front of the eye is affected, then we term this anterior uveitis. If the middle part of the eye is affected, then this is called intermediate uveitis, and if the back part of the eye is affected then this is termed posterior uveitis. One or both eyes can be affected by uveitis. There are many possible causes of uveitis, ranging from infection by bacteria, virus, or other microbes, to those types caused by autoimmune conditions, or generalised inflammatory conditions. The cause of uveitis is often determined by taking a thorough history, examination and then sometimes further investigation if appropriate. In some patients, the exact cause of uveitis is never found, though it is important that serious causes are excluded, particularly when both eyes are involved. The extent of your symptoms will relate to the type of uveitis and indeed the cause. In an acute episode of uveitis, pain and photophobia will frequently be the most noticeable symptoms. These will often develop quite suddenly. There are, however, forms of uveitis that can present more slowly and may just present with blurred vision and few other symptoms. Therefore it is important you are examined by an expert to determine the exact cause of the symptoms promptly. Treatment depends on the cause, severity and location of the inflammatory process. In simple cases of anterior uveitis (affecting front chamber of the eye (Figure 1)), steroid drops are usually started to help reduce inflammation within the eye. These will often be applied quite intensively for the first few days, and then gradually tapered off over the coming weeks until no further drops are required. At the same time, we will often prescribe a drop to help relax the tiny muscles within the eye and to dilate the pupil to prevent the iris sticking to the lens. This will often only be for a short period of time, though this may cause transient blurring of vision. Occasionally it may be the case that oral steroids are required to help reduce inflammation within the eye, but this very much depends upon the cause and the severity of inflammation. For example if the inflammation is affecting the back part of the eye and/or vision loss is rapidly occurring. If it becomes clear that steroids will be required for some time, then it may be appropriate to look at other forms of immunosupression (steroid sparing) but this would be discussed at length. In these scenarios extensive investigations are performed to determine the cause of the inflammation in particular if an infection is suspected. If an infectious cause of uveitis is suspected, it may be required to take a small sample from within the eye to determine to exact cause. This is infrequently the case, but can be an important part of the management of uveitis. Treatment with appropriate anti microbial is required to manage the inflammation. Often in severe cases of uveitis regular visits to the hospital is required to ensure that the condition is brought under control. If the attack of uveitis is severe, then this can cause significant problems with vision. It is therefore crucial that if you are having such symptoms you present as soon as possible. Topical steroids (corticosteroids) are the mainstay of treatment in anterior uveitis, though these can induce raised pressure within the eye and even cataract. Raised pressure can be managed with other topical medications, whereas cataract is typically dealt with by surgery at a later date. Oral, intravenous or intravitreal immunosuppressants have numerous side effects. The list is exhaustive and out of scope for the material provided here but often management of complex uveitis will include a multidisciplinary team to manage dosage, investigations and anticipate side effects.